Huzzah! 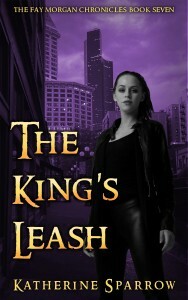 Today is the publication day for The King’s Leash, my seventh novella of The Fay Morgan Chronicles. What’s going on in Fay Morgan land? Well, to start, Morgan le Fay is in a terrible mood. Not only is she the unwilling master of her best friend, the djinn Lila, but Lila’s boyfriend has been made Sheriff of Seattle by some mysterious force. He won’t explain how or why, and wears a strange silver star upon his hip. Soon Morgan and Merlin find themselves exploring a faerie hill hidden in the middle of Seattle. The famed witch and wizard go there to stop a violent creature, but what they find sets in motion a series of events that Morgan could not have possibly imagined. It drags everyone into its twisted and gray web, where everything comes at a price, and even kings wear leashes. I love The King’s Leash, and I hope you will too! Also, while you are at my website, please feel free to sign up for my newsletter. Thanks!